30 Floods will be developed in Workshop this upcoming year as part of UTNT | University of Texas New Theatre for Spring 2019. I've been granted a Creative Residence at SPACE on Ryder Farm! I'll be heading up there mid-June to work on some new work. Stay posted; can't wait to get on the farm! 893 | Ya-ku-za has been selected for presentation at the Consortium of Asian American Theaters & Artists in Chicago, from August 13-18. Huge thanks to the folks at CAATA for having us! Chicago friends: Come Check it Out! I've been selected as a Writer-in-Residence for The New Harmony Project! I'll be there May 21 - June 3rd developing a few projects. Huge thanks to the folk at The New Harmony Project for having me! Produced by GenEnCo, 893 | Ya-ku-za will receive a Workshop Production at The Vortex from January 26-February 10, 2018. It will be directed by kt shorb. Check out their full season here. Two small (minute!) pieces of mine will be featured at the Austin One Minute Play Festival, which runs from August 29th & August 30th, 2017. Come check it out! More information can be found here. Faster Than Bullets has been included in Issue 3 of The Dionysian. Thanks to everyone who came out to hear a reading of 893 | Ya-ku-za! It was great to have you and your brains in the room. Special Thanks to: Alani Chock, Annie Kim Hendrick, and Margaret Jumonville for reading, and to KT Shorb for directing. anxious 20yr olds asked me to write a few monologues for their dance show "This Isn't New." Come check it out: May 13 & 14th at the Museum of Human Achievement! Along with 105, I co-wrote the libretto for Golden, an immersive mini-opera with Michael Zapruder. 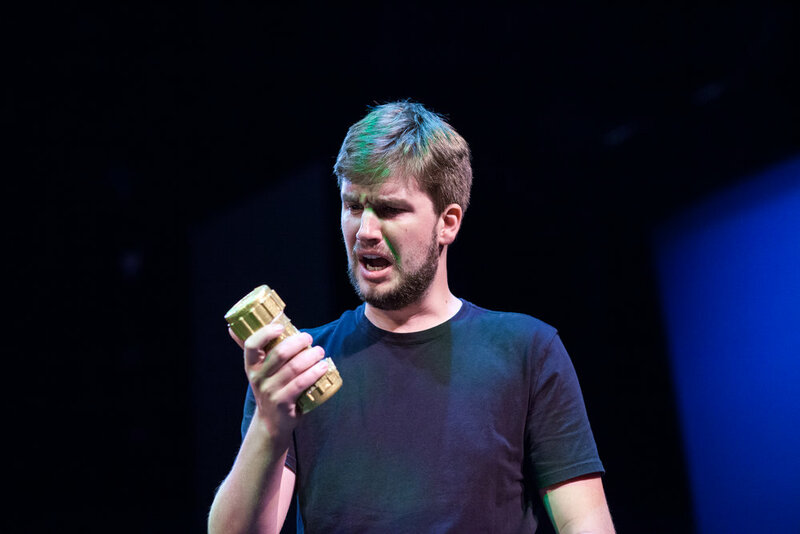 Golden is a cutting-edge chamber opera that combines acoustic and electronic sounds, powerful voices and evocative immersive elements to tell the true story of a family whose belief in a magical golden object is tragically destroyed by the forces of technology. 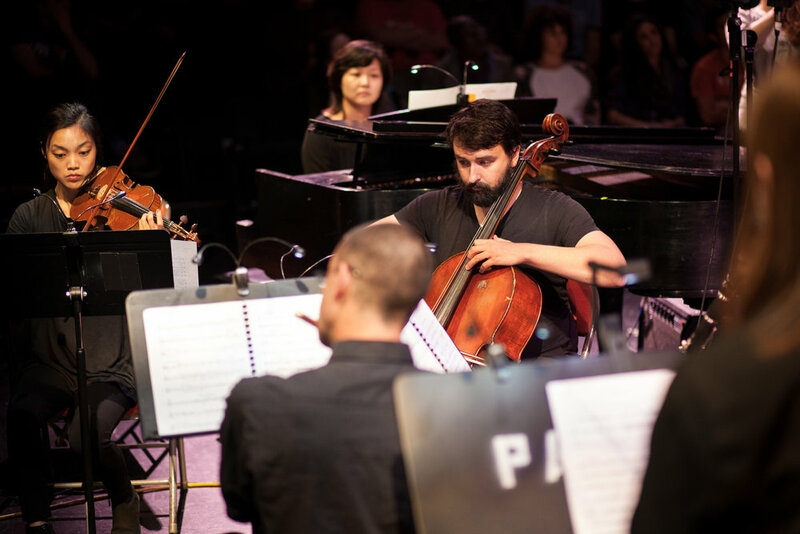 It premiered at The Cohen New Works Festival, April 10-14, 2017 at The University of Texas at Austin. It was directed by Margaret Jumonville. 105 is running as part of The Cohen New Works Festival, from April 10-14th. Come check it out! 105 is presenting a dance excerpt of Part 1: Walking Days at FronteraFest. Presented by Hyde Park Theatre in collaboration with Scriptworks, FronteraFest is one of Austin's longest running Fringe Festivals, now in its 24th year of highlighting new, alternative and offbeat theatre. Faster Than Bullets has been named a Semi-Finalist in NYCPlaywright's Women in the Age of Trump. We did a closed reading of 893 | Ya-ku-za at 440 Studios, this past week. So great to have such brilliant minds in the room. Huge Thanks to: Holly Chou, Rachel Lin, Kristan Seemel, and Sarah Haber. Here's to making new work better. Director Graham Schmidt asked me to step on to be Playwright-in-the-Room for the devised piece, "The Sonnets Project." “The Sonnets Project” is an immersive, site-specific storytelling experience that invites audiences to consider, “If you had a chance to make a statement as you crossed over into the next life, what would you say?” Infused with music, dance, physical theater, and tons of love, “Sonnets” takes as its springboard the life of Wendy Johnson, a character from Jose Rivera’s play, "Sonnets for an Old Century." This is a performance about what we hold on to, and what we are able to leave behind, in an imagined waiting room between this life and the next. The Sonnets Project ran from November 16-18th, 2016 at The University of Texas at Austin. So, I'm in the process of writing a post-apocalyptic trilogy call 105, that spans radio-play, immersive theatre, and dance ballet. And that piece has gotten accepted to The Cohen New Works Festival. Occasionally, I'll be writing posts for the MFA Years. The Cocktail Party Pitch: I write immersive theatre and work that seeks to redefine the theatre going-experience. What That Actually Means: I like writing work where you’re not just sitting and watching. Maybe you’re wandering around, maybe you’re eating something. I like writing work that’s experiential (whatever that means) and weird. I like work that surprises you. Other Things You’ll Find in My Work: Strong female protagonists, because, yes. Wild broken things. Poetic stage directions. The agony of choice and the suffering of love. Untameable was nominated for a NYIT Award for Outstanding Choreography and Movement. What was your favorite part of working on this production? Ian: My favorite of working on Untameable was the process of translating Daria's words into movement. Due to the enormity of the script and the many different pieces required to make it happen, the rest of the scenes that occurred outside of the vignettes between the Lady Queen and the Boy Prince were highly structured and needed to be as such to work effectively. Our moments were so flexible and fluid. It was very freeing. Nikita: My favorite part of working on this production was interacting with the audience. Particularly as an immersive show, every evening was extremely different based on the audience's energy. I was able to feed off of their responses, as well as off of the work of my dance/devising partner, Ian Stewart every night. Often Ian and I had to work around bodies in our playing space so while we had structure, the moments of improvisation were thrilling. Daria: The people. We assembled a smart, ambitious, passionate, talented beyond talented team. It was a dream. Right before heading off to grad school, we did an awesome reading of The One You Feed at 440 Studios. Kristan Seemel directed, and Rachel Lin, Rachel Christopher, Olivia Jampol, Geany Masai, Fedna Jacquet, Annie-Sage Whitehurst, Maki Borden, Inés del Castillo, and John Racioppo brought the piece to life.